I felt like painting something different the other night, but then it went all wrong. I picked this bluebird, from Bird On A Wire, not because the subject matter was different, but because I want to play with a different style. My goal was to be less controlled and more dynamic. I started with a complete wash of all the base colors. Then I was going to start blobbing in some deeper colors. I thought “just a touch up here and there”, and soon I’m back to my regular style. I believe the one’s style is a bit like one’s personality. It is difficult to change, which isn’t necessarily a bad thing. However, it is a challenge none the less. 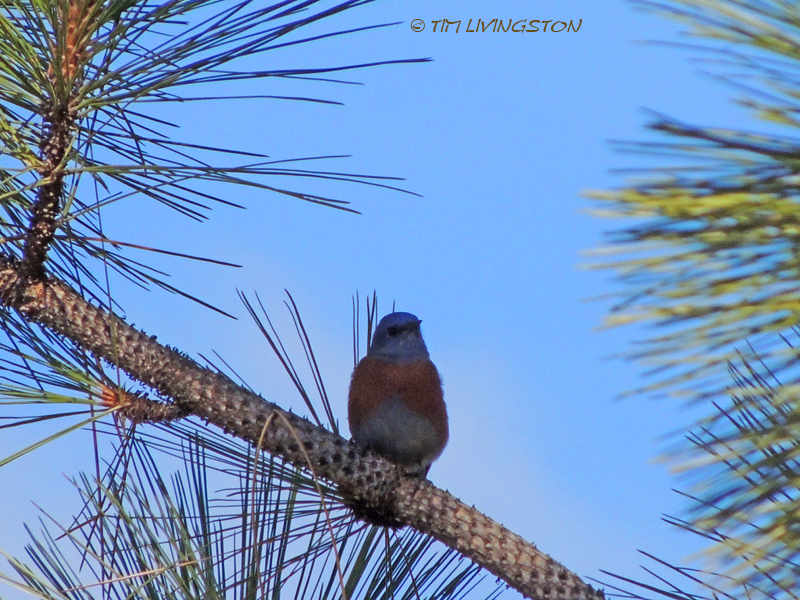 So here is my different…not so different Western bluebird. 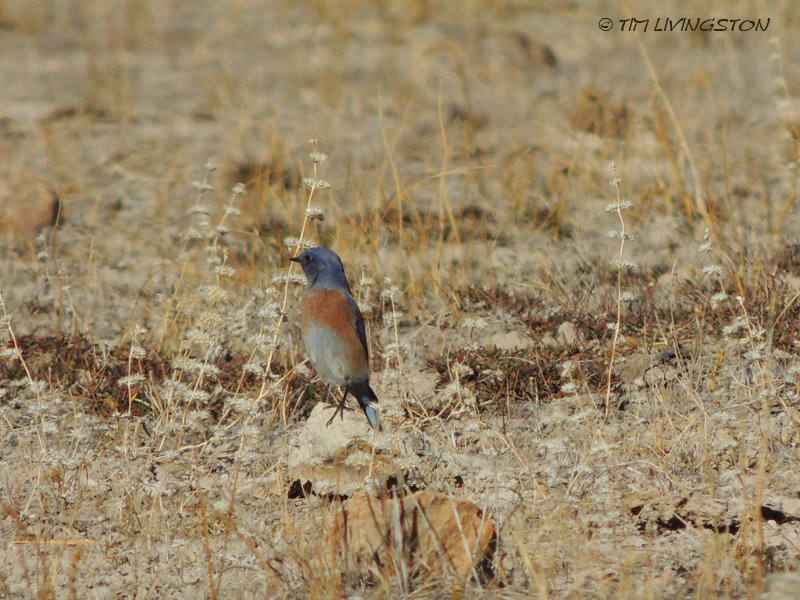 A couple of days after I painted the bluebird, I happened upon a flock of Western bluebirds on the hunt. They were working this meadow like a pride of lions after a herd of gazelle. They would hop up onto any high point to search for their prey. Usually, it was a rock or a tree seedling between six inches and eighteen inches above the ground. They would survey the ground around them until they spotted some hapless insect. Then they pounced. Their movements looked fairly random, but as I watched them I noted just how systematically they worked the meadow. 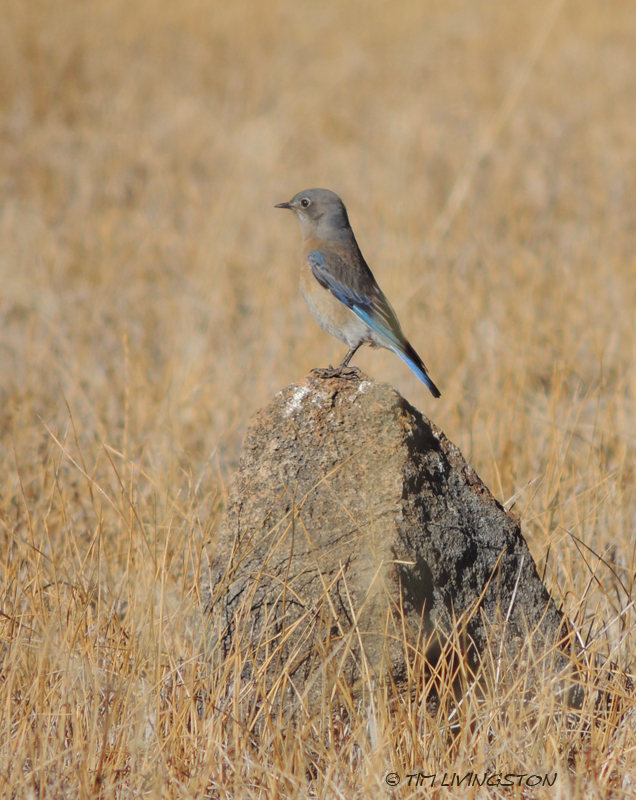 The female bluebird searches for her prey. 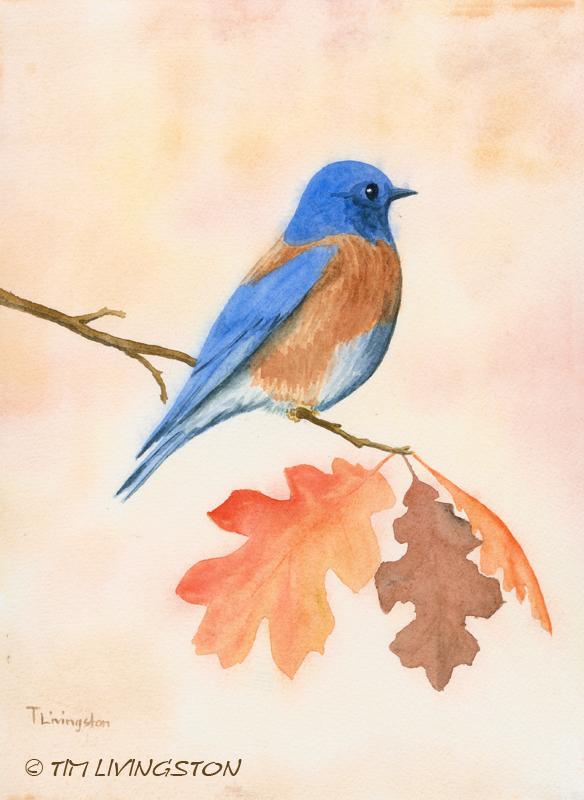 This entry was posted in Traveling Companions, Watercolors, Wildlife and tagged birding, Blitz, bluebird, Forester Artist, golden retriever, watercolor, watercolour, Western bluebird, wildlife by foresterartist. Bookmark the permalink. I think it’s great Tim – really like it. I know exactly what you mean when you speak about trying to change the style. I had to laugh when you likened to trying to change your personality. That’s so true. I’m sure they connected in some way. Love your stye and your interesting photography, which always tells a story. Love those bluebirds. Paint ‘m. Photograph ’em. Anyway you like. Tim, we can all relate to trying something new and slipping back into something old. Thank you Barb. You have a beautiful style, and so bright. I don’t really want to change what I do, I just want to add to my repertoire. I’m going to keep working at it, but don’t expect any Earth shaking changes. There is nothing wrong with having your own style. Evolving and challenging oneself is a good thing. The blue bird painting turned out really well regardless. And that is as is should be. In my world anyway. Great images and informative too! Thank you Susan. It’s is fun to play with the brushes now and then. Who would think it so hard to break from what I normally do. I don’t seem to stray far from my comfort zone so understand. Yvonne, you are making me blush! Thank you. I have to include Blitz, just for the gratuitious bliss she provides! Besides, she wouldn’t have it any other way. Beautiful painting Tim and love the bird photographs – try as I might, loose style never comes to me even though I try as well. I love your style as it is. Keep playing with media you don’t usually use. The only thing you have to do is make yourself stop before you even think about detail. Think of it as an experiment, not something that has to turn into a finished painting. Then put it away for a few months and go back and look at it with new eyes. You might be amazed, or at least intrigued! Good advice Alli. I will give it a try. Such talent! Sometimes your can’t fix awesomeness 😉 Blitz… such a show stealer! Aww, thanks Ilex. Blitz loves to perform! Very nice! My favorite bird! All, just so very lovely! Thank you Elena. I think you are one of the most versitile artist I follow. You are an inspiration for me. I think you should strut your style – as there’s nothing wrong with the gorgeous painting you did! Do you ever sell your work? And Blitz is onto you, hoping to exchange that piece of wood for a bird! Thank you Megan. What a kind thing to say. Ok, I’m going to strut now …….oops, had to stop people were starting to stare. 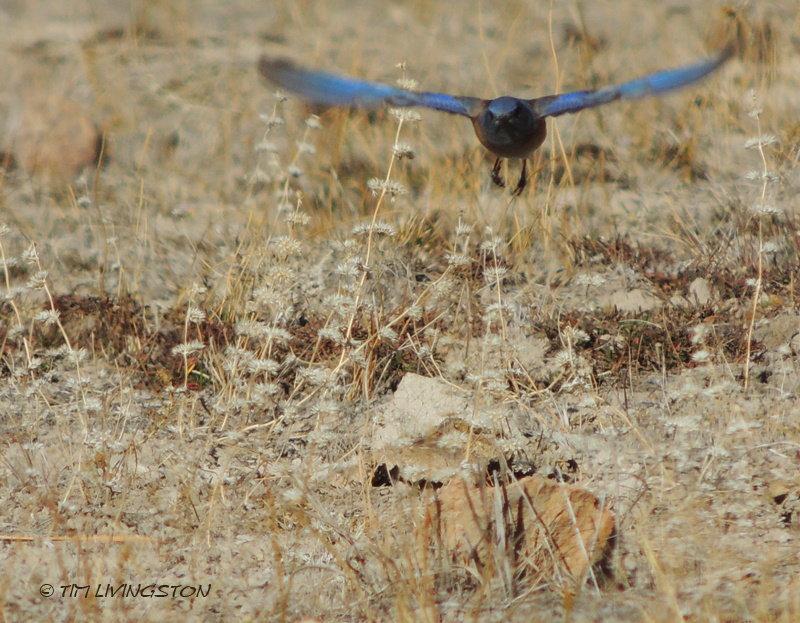 As for Blitz, those bluebirds don’t know how close to death they came. 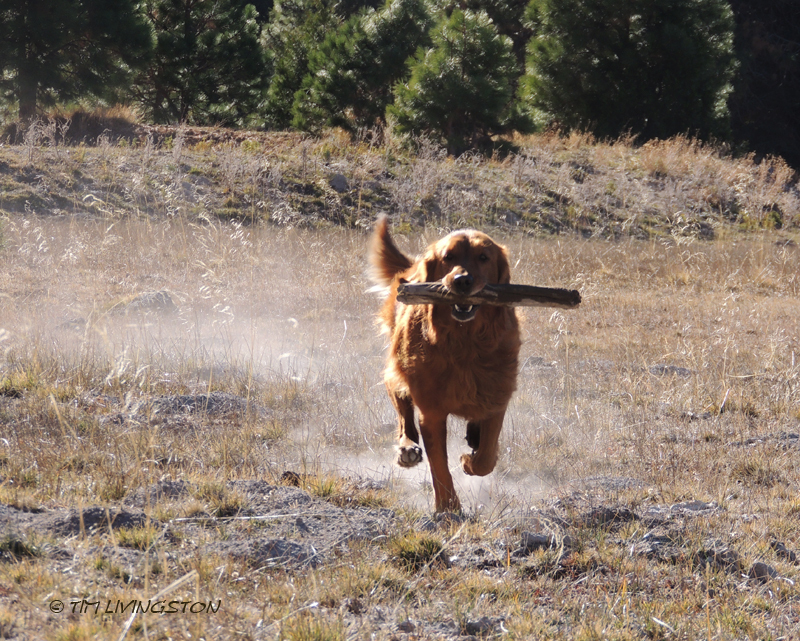 Sticks are great, but birds..now that’s what she is talkin’ about! You hit the nail on the head about someone’s style being like their personality.I have been exposed to both the controlled and detailed watercolorist and the loose and impressionistic and I don’t think one is better than the other. When we try something new that we have seen someone else do, we generally learn something that we can use and move forward with, like a new color or a new way of applying a stroke, but it will always come out as looking like our work. That is the joy of it I think. I like your bluebird and I like your description of them being on the hunt, but I still like that red dog the best, Tim! Your art is always impressive and I like your attention to detail! Thank you very much Paula. You have a beautiful blog. I really enjoyed your photography. I love bluebirds, and I love what you tried. When I tried the same many a paper went into the dustbin, but looks like your’s made it just as well as all your other works. First impressions were that it looked so simple and light on the eye but I also noticed the strokes that you might have touched up towards the end, as a habit. It definitely looks different, and refreshing too. On a separate not, My book arrived, Firestorm in the Forest, and it is as beautiful as you and Mary (I mean your personalities! 😀 and otherwise)… Learning about the firestorm though it’s meant for kids, who said I can’t turn the clock back? Thank you so much for the signed copy and code. Divya, thank you so much. I’m so glad you like the book. It was a labor of love. Well, I went wrong because I didn’t achieve style-wise what I wanted. I like the picture, but I was going for something different. I will have to try again. 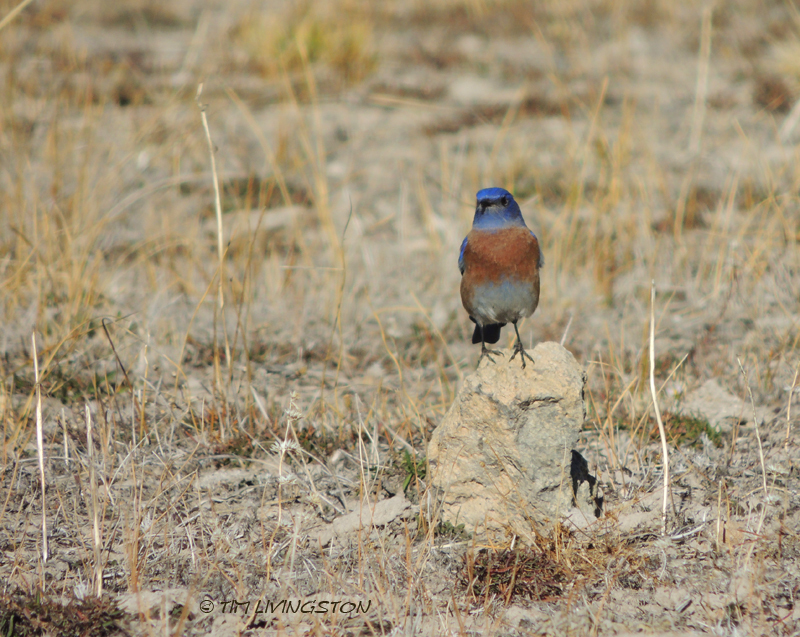 I see bluebirds around here but I didn’t realize they were such hunters. I know what you mean about trying something new and how hard it is not to fall back into old habits. We artists shouldn’t look at any painting as “failed”. When we experiment, we can grow and should always look at the work with that in mind. There is always something to learn from the process. I think your bluebird turned out well. It may take a while for you to feel as though your style is loosening up, but keep at it. Then maybe you can incorporate what you have learned into your “old” style. I don’t really feel like the painting was a failure as much as my attempt to loosen up my style was. However, I did learn from it and I’m already plotting my next attempt. It is fun to play with it. It keeps thing interesting. That was great:) The photographs are wonderful and so is your painting. Thank you so much. I’m going to take another crack at it! Happy Thanksgiving…..Very impressive. Thanks for creating, informing and sharing. Hi Carol, Happy Thanksgiving! Big hugs your way! We look forward to seeing you, Toby and Tessa soon. I hear Tessa did great at the event you weren’t planning to participate in. Well done. Hi, Tim! Apart from bobbing the bird under water six feet from shore and giving the nice judge a minor stress attack? She did well…and her line manners are improving. Thinking fondly (and wistfully) of you as I am FF Tessa……I thought Toby was hard (couldn’t have done it without you! )……with experience, I now realize how easy Toby was! Are you taking commissions? Is that the correct term? You may not have run Toby, but now you get to do it with Tessa. I haven’t been doing any commissions, but we can talk. Ah, your painting is really beautiful, Tim! I’ve missed your posts for long time as I was( am! ) little busy.